Murdoch’s Aspirations and Pathways for University (MAP4U) program supported schools and agencies to develop and implement a range of innovative programs designed to increase the participation in higher education of underrepresented students from the south-west corridor of Perth. MAP4U was conceived as applied research, with high accountability for schools in the region through mutually developed key performance indicators and a commitment to co-invest in programs. MAP4U operated from 2012–16 and used surveys, interviews, and observations of school and student data to identify gaps, evaluate processes and analyse set outcomes. not-for-profit organisations: Big Picture Education Australia, South Metropolitan Youth Link and Youth Connect. The key project goal was to develop sustainable school-led programs to build aspirations in schools and learning links to university, increasing tertiary participation of local students. Four programs were implemented, linked to each school through a School–Murdoch Compact that key stakeholders agreed upon and committed to. The Compacts designated both the level of program commitment and specified performance indicators. Building Academic Aspirations and Achievement: This supported adolescents to set goals and fulfil their aspirations to transition to higher education. Developed programs included individual pathway plans, scholarships, parents as career partners, and partnership with the Australian Indigenous Mentoring Experience (AIME). Innovative Curriculum and Pedagogies: This supported innovative curriculum and pedagogies to engage young people and connect students with university mentors and industry professionals that shared the same interest. Developed long-term programs included film making, games art design, robotics clubs and English support. School Within a School/Big Picture Academy: Students disconnected with existing curriculum accessed Big Picture Education programs that provided alternative models of empowering young people in their learning while linking to university preparation. University Enabling Programs: These supported Year 12 students who aspired to go to university but did not study ATAR (for direct entry). An after-school enabling program was developed (Murdoch pathway program TLC110) which complements school achievements and provides an alternative pathway to university. Over five waves of data collection, 1,429 students participated in a MAP4U survey. The students were from Years 7 to 12, and two-thirds indicated that they desired to go onto university study. A four per cent increase in the number of students from the region applying to university. Increased engagement with schools across the region to implement sustainable, innovative programs, which encouraged students to aspire to university, totalling 172 programs over the four years. Increased community engagement through the development of aspirational academies/curriculum/pedagogy within schools, which increased student expectations to attend university after secondary school. Identification of a gap for students between their aspirations for a university degree and their perceptions of realising this goal (i.e. expectations). 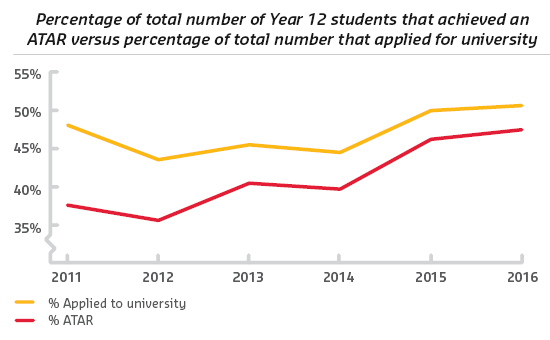 Increasing the percentage of Year 12 students that study ATAR from the region means schools have developed a culture of higher attainment and challenged staff to build aspirations and deliver improved outcomes with more effective pedagogies. Increased university applications up to 2016, above and beyond the percentage of students completing ATAR pathways, was achieved through nurturing the aspirations of students by providing alternative pathways to higher education, such as studying university enabling programs (for example TLC110), portfolio preparation and entry through TAFE Certificate IV. Many MAP4U programs are now embedded within schools and curriculum. Robotics and STEM clubs continue to flourish, and robotics forms part of the curriculum. Individual pathway planning and academies have been incorporated within school structures. Murdoch University supported the University Enabling Program TLC110 and scholarships are continuing to be distributed across the schools from a variety of stakeholder contributions. Engagement between stakeholders continues with university staff fulfilling roles on school boards, education and training committees and development commissions. Overall the culture change, to provide opportunities for students from the region to study in higher education, continues. MAP4U research over the past four years indicates that the students in the south-west corridor of Perth have relatively high aspirations for their academic and professional goals, so it is important to see schools in the region support their students and demand more from their capable and resilient staff and students. This case study was one of 35 featured in the NCSEHE’s 2017 publication Higher Education Participation and Partnerships Program: Seven Years On.